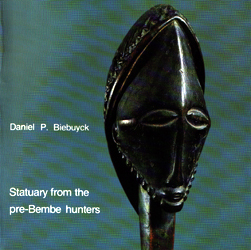 Statuary from the pre-Bembe Hunters. Issues in the interpretation of ancestral figurines ascribed to the Basikasingo-Bembe-Boyo. EDITOR: The Royal Museum of Central Africa - Tervuren - Belgium 1981. Statuary in the collections of the Royal Museum of Central Africa. The Museum Dapper is a private Parisian museum created in 1986 which defines itself as a «space of arts and of cultures for Africa, the Caribbean and their diasporas». His name pays tribute to a Dutch humanist of the XVIIth century, Olfert Dapper. Olfert Dapper foundation is born in Amsterdam in 1983, in initiative of polytechnicien Michel Leveau, industrialist, to recommend Africain governments  and soon possessor of «one of the most abundant collections of African art in Europe». Asserting his will to help in knowledge and in preservation of the heritages of sub-Saharan Africa, foundation allocates grants of studies and of research in the domains of history and of ethnology, as well as help to publications. A non-profitmaking organisation is created in 1984 by the president and his wife. Christiane Falgayrettes-Leveau, native to Guyana and alumna of Maryse Cop, is then journalist specialised in the literature of the black world. In May, 1986 she takes the direction of the museum which becomes established first in a private residence of the avenue Victor-Hugo, constructs by Charles Plumet in 1901, a modest space (500 m ²) which they achieve by a small court planted of bamboos and brackens.